A CMS (Content Management System) allows you to control and manage the content of your website with little or no knowledge of coding. It provides an easy interface to add / delete new pages and edit the content within. CMS offers a site-search tool for the visitors to find any specific content they are looking for. At Webguru Infosystems, a leading CMS web development company in India, we deal with all types of open source content management systems and provide customized solutions to meet your needs. It reduces the website maintenance cost by providing the website owners with the ease of managing their sites single-handedly. 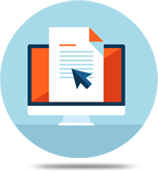 Edit, modify and format your content easily with WYSIWYG editor. A CMS supports seamless management of media and document files. Any Content Management System allows you to develop and maintain a multilingual website with little effort. You can connect your website to your social media networks and integrate its feeds on your website with ease. An SEO friendly coding structure helps rank your website at the top of search engine results. We can build you a mobile-responsive website that is completely up-to-date with the latest features and provides a smooth user interface. Our expert developers can help you, if you wish to take your website from one CMS platform to another. We are always here to help when you need a version upgrade of your existing website. We will also integrate new plugins and components if you want. You can reach us any time for any kind of assistance regarding your CMS website. We are always in all ears. Hire CMS website developers from Webguru Infosystems to build your business website cost effectively. CMS web development has come a long way from creating simple catalogs to being the significant platform for a wide variety of websites. Although there are numerous Content Management Systems in the digital sphere, the 4 most popular ones among them are WordPress, Magento, Drupal, and Joomla! Wordpress is simple and flexible, making it a popular choice for programmers and business owners alike. Consequently, it comprises of roughly 28% of the entire web with big brands like TechCrunch, BBC America, Sony Music and MTV News using this platform to enhance their digital presence. As a leading CMS website development company, we have a dedicated team of experienced WordPress developers to work on your projects. Drupal is for magnum projects, the big ones that require top-notch security and usability features. Drupal scores well in that area. The custom CMS website development professionals at Webguru Infosystems are well acquainted with this platform to build you a highly secure, flexible and user-friendly website. We specialize in Drupal website design, theme and module development along with maintenance and management support. Magento always stands out as the most reliable eCommerce platform ever. It provides business owners with feature-rich shopping cart solutions, flexible enough to operate and manage without much technical know-how. Build on the PHP framework, it is quite scalable to meet your business growth requirements. At Webguru Infosystems, our Magento developers have years of experience in developing a variety of websites on this platform. You can hire us to create a unique shopping cart solution for you. Joomla is a feature-rich, user-friendly CMS platform, suitable for developing professional applications and web portals. It is also a widely used eCommerce website development platform for both big and small businesses. Its built-in components and third-party tools make it one of the most desirable platforms for business owners. Our developers have extensive knowledge of this platform required to build websites that stand out from the rest. Website For Eco-Certified Products & Services Avail eco-certified Personal Computers and cloud services at Centerra Tech for sustainability. Website For Business Consulting Firm Alston Advisors is the go-to destination for administrative and operational help regarding your business. Website For Local African Communities The Haji Hussein Group endeavors to establish healthy business relationships with the local communities in Africa. Nowadays, almost every business has experienced that it can succeed when its offerings are visible to their customers. For that reason, business owners invest in spending money on developing visually attractive websites and look for sophisticated SEO experts to differentiate themselves amidst the clutter. Nowadays, customers are acting as scanners. They need information that is easily searchable for making purchase decision.